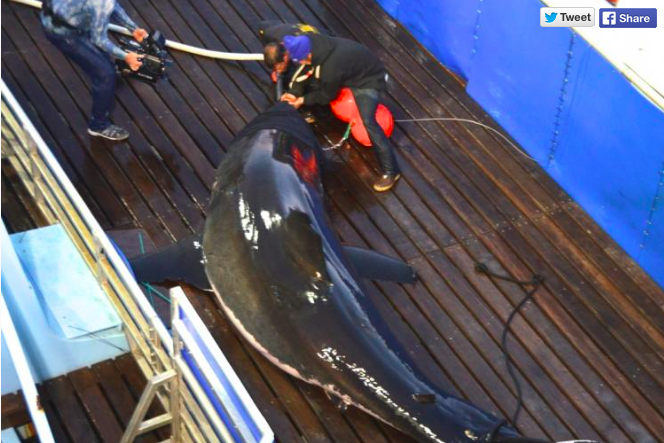 Earlier this month, a 16-foot, 3,456-pound great white shark named Mary Lee was spotted at the Jersey Shore. Her movements have been followed since September 2012, when the nonprofit research organization OCEARCH, whose mission is devoted to the study, safety and tracking of sharks, tagged her with a GPS tracking device. Since Mary Lee appeared nearby Atlantic City on May 8, her popularity on Twitter has netted her more than 50,000 followers, up from 12,000 less than two weeks ago. While the fake @MaryLeeShark handle is not associated with OCEARCH, the organization does run a site that allows users to track Mary Lee's movements in real time, providing the basis for some of the Q & A fun on Twitter. WNCN asked @MaryLeeShark, "Any chance you'll swing by the North Carolina coast for Memorial Day weekend?" Ekim Nagorb asked @MaryLeeShark boxers or briefs? Kim Rules asked, @MaryLeeShark...What do you do when you see other sharks? OCEARCH's multiyear project, which tracks hundreds of sharks, is important to shark researchers because with a recent increase in sightings along the Atlantic Coast, there is still much to be learned about mature great whites, the Associated Press reports.